Since before even the Roman Empire, a small town in Spain has played host to an annual ritual that sees young men and women wrestle wild horses into submission, then trim the flowing hair along their mane and tail. This year, we were there. All I could see in the darkness were the shapes of horses as I closed my eyes to sleep. A pulsating mass of dust, colors, and hooves. Hundreds of mares and stallions packed tightly together into a surging ball of life surrounded by a wall of stone. The crowd cheering for the Rapa das Bestas. Once a year the small town of Sabucedo in Galicia, Spain, becomes host to one of the wildest festivals in the world. 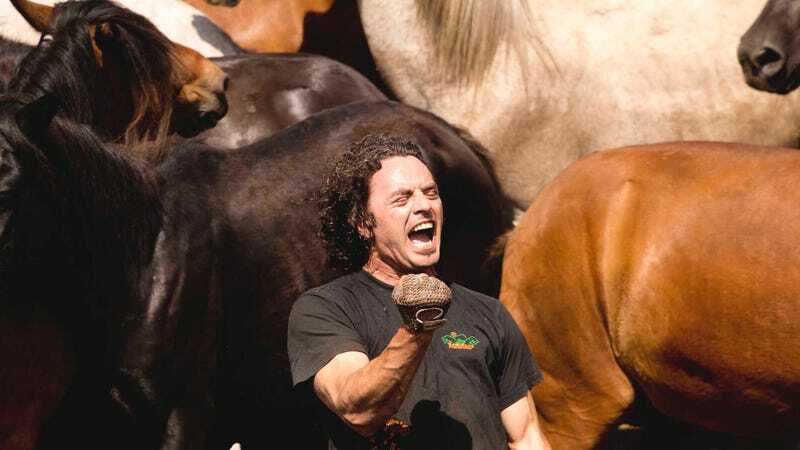 The Rapa das Bestas, literally meaning to cut the hair of beasts, takes place on the first weekend of July and involves a handful of men and women in a granite ring filled with hundreds of wild horses, tasked with wrestling them by hand into submission and cutting the long, flowing hair on the horse’s mane and tail. No one knows exactly how this ancient ritual and rite of passage started but there is evidence to suggest that it may have been played out even before the rise of the Roman Empire. The road to Sabucedo is narrow; winding through ancient stone villages scattered throughout the mountains. The air is sweet and humid. Covered in temperate rainforest and eucalyptus plantations, vivid green moss clings to every possible surface of this land. These misty, rain soaked woods hide hordes of red deer, wild boar and wolves, as well as herds of majestic wild horses. Living high on fog shrouded peaks, these animals are secretive creatures. As the sun lifts the early morning mist on the first day of the festival, a priest gives a sombre mass to pray for the safety of those who will take part. Villagers then head up the steep mountainside on horseback to seek out and round-up the wild horses scattered throughout the dense forests. The work is taxing, as the horses seek cover and try to avoid their pursuers, but eventually horses start arriving into town and are corralled. Then next day the real event starts. As the shrill sound of Celtic bagpipes sing out over the spectators in a packed stadium, the wild horses are herded through the town streets, the herd walled only by mesmerized onlookers to the gates of the arena. Dappled grey, chestnut and luminous black coats stream in, more and more, until the energy and life of the arena floor is overflowing. And still more come. Swirling and pulsating, the mass of horses seems to move as one living soul, its breath heaving under the Galician sun. Aggravated, glistening stallions rear up against one another, teeth bared. Hooves fly. Children are the first to lay their hands on a horse. Adults bring in young boys and girls to grab, wrestle, and separate the young foals from the herd to keep them safe and out of the chaos. I watched as a young girl, no older than 10, was carried in by her father, put in front of a foal, and without hesitation, she lunged at it. Within seconds, with the help of some adults, she had the animal under control and led out of the stadium. Confidence booster for a child if ever there was one. Once all the foals have been led out, it is time for the adults to take a turn. Men eyed the horses to select the right target from the drumming mob. One man, hair greased back and tattooed arms, leaned forward and readied himself. With a running leap he launched from the dusty ground onto the perspiring bare back of a great stead, gripping it with one hand by the hair, holding on for dear life. The horse took off as the rider, wild eyed, whooped for joy. Dashing and twisting, muscles bulging beneath its sweaty hide, the grey stallion did its best to rid itself of the assailant, but soon another man joined in and grabbed the horse by the head trying to cover its eyes. Finally, a stocky brute of a man, head balding and already carrying a black eye, charged in and latched onto the horse by the tail, attempting to anchor the steed. The horse lashed out, but in a surge of synchronized energy the men tipped the dance in their favor and the beast came down to earth. With its eyes covered the horse quickly calmed as its mighty chest rose slower and slower. A support team came to the aid of the wrestlers to keep the other massive animals at a safe distance so the men could do their work. Sheering scissors flash in the glare of the sun. Quickly and skillfully the hair is cut and placed in a woven basket. The men released the animal and backed away cautiously. The stallion swung his head and body upward, got to his feet, and rejoined the herd. The crowd cheered and the men rejoiced. Lasting hours, this process is repeated hundreds of times, exhausting man and beast until each horse has been tackled and sheared. Finally, the gates are opened and the herd is led out to a coral. The cut hair will be kept as a keepsake and the horses’ health inspected soon after. The crowd will party throughout the night in celebration of tradition and life. On the final day of festivities the wild horses are once again paraded through the streets of Sabucedo and up to higher ground. The horses are then released to the pull of the mountains, to live out another year, free in the wild. The Rapa das Bestas is still a fairly local event but it is extremely popular. Tickets need to be bought far in advance. I drove from Avila, stopping to taking a day on each end of the trip to visit Sierra de la Culebra to try and to see wolves, which I would highly recommend. Accommodation in Sabucedo can be scarce. Camping is an option if you show up a few days in advance, otherwise there are many rural hotels and inns to consider. Here’s a great place to sleep sound under the mountain, with dreams of wild horses.